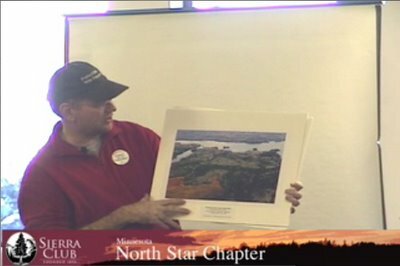 I was happy to find out that my recent project for the Northstar chapter of the Sierra Club has made their front page of their website. Erika approached me about a month ago asking if I might want to capture some content for them on their Mining Without Harm campaign. From there I worked with Clyde to determine an appropriate presentation to capture. The entire page was created with Apple's new iWeb '06 and the video files are stored on Veldhiezen's server. For this project I've compressed the video for streaming, for the video iPod, as well as an audio file for those with dial-up only access.